A community of individuals dedicated to sharing the mission and value of transformative grief. ~ Grieving differs significantly from depression. ~ Grieving is a normal healing process. ~ Grief when fully experienced leads to growth & transformation. ~ Effective grieving integrates mind, body, and spirit. ~ Grief extends beyond coping, adjustment and survival. ~ Validating grief is important for healing. ~ Friends, family and professionals affect grieving. ~ The nature and circumstance of the loss impacts grieving. ~ Education, creative expression, support groups, and counseling can empower the bereaved. Hello, Welcome to INTEGRA's Website where you will find articles and other resources for help with loss issues and the resulting grief. Our co-founder, John M. Schneider, PhD, sadly died in April 2012 (see information here), but finished a new book days before the accident that led to his death. 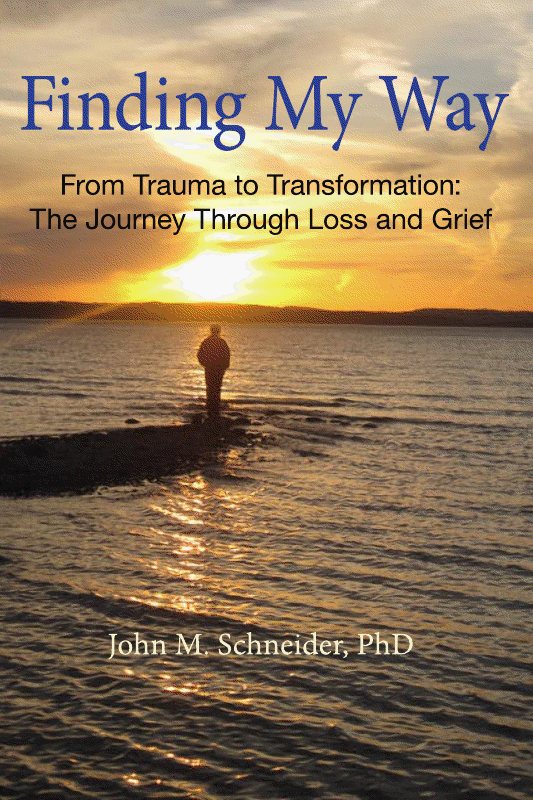 FINDING MY WAY From Trauma to Transformation: The Journey Through Loss and Grief by John M. Schneider PhD (Seasons Press, 2012). Just as important as proposing a model of grief, John describes at length the problem that "medicalizing" grief presents to society – of misdiagnosing normal grief as depression or PTSD. Current medical and psychological approaches misunderstand and mislabel grief and thus often produce effects directly opposite to the ones intended. This is an updated and revised edition of Finding My Way: Healing and Transformation through Loss and Grief and represents over forty years of clinical practice and experience of the author, John M. Schneider, PhD, as well as the accumulated wisdom of colleagues. It includes the stories of people in grief, who have discovered the transformative role that loss and grief play in their lives. Finding My Way represents a major contribution to the understanding of loss and grief. It is written for a general audience, especially for those experiencing grief. It is also a valuable resource for people who want to support those in grief. Professional caregivers will also find this book valuable. The information and wisdom contained within are timeless and will serve as a valuable resource for a very long time. Dr. Schneider's book informs one's spirit as well as one's mind. It has been helpful to me in walking with others through their losses and helping them to heal while uncovering the transformations apparent and possible in their journey. This book is available here, or by contacting SZimmerman@integraonline.org. You also should be able to purchase this through your local bookstore. The process can even be transforming, opening new strength, new energy, and new wisdom! It is a process of discovery.